Collaborative Practitioners, Collaborative Schools is an important resource for those who are building their capacity and skill for collaboration. This new edition continues to provide a vision of schools as learning communities, not just for students, but also for teachers, administrators, parents, and cross-institutional professionals. Part one traces the development of collaborative partnerships in schools. Part two breaks collaboration down into its component communication skills, illustrated by sample dialogues. Part three explores the numerous contexts in which collaboration can help schools achieve educational goals and improve student learning. 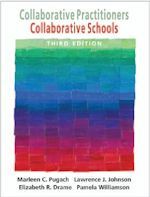 The third edition includes a new chapter on collaborating for curriculum decision making. It incorporates the latest in special education law, using technology to support collaboration, and educational research. This revision continues its emphasis on diversity, home-school partnerships, and interagency teamwork. It outlines practical strategies for planning, implementing, and evaluating creative solutions to the challenges today’s educators face.